Vampyre is that rare beast, a picture book for older children. It was written by Margaret Wild, illustrated by Andrew Yeo, and published by Walker Books, 2011. I am Vampyre. Feared. Despised. I live in darkness. I long for light. I am not a fan of the current vampire craze. 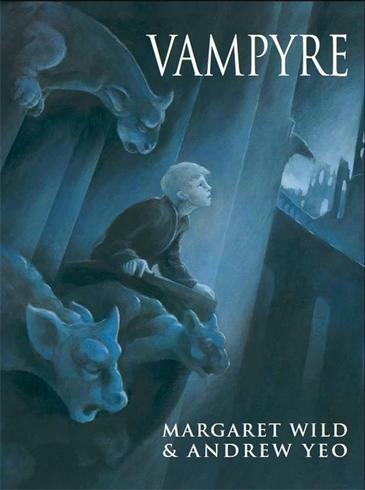 But being a long-time lover of Margaret Wild's books, I took a look at Vampyre and was immediately intrigued. Its lyrical text shows us what it's like to be shunned and despised. The boy/vampyre must live in darkness, yet longs for the light. We can think of many reasons someone might long to live a different life to the one his family espouses, making this an excellent prompt for meaningful discussions. There's so much in Vampyre that is not said - provoking thought, and bringing emotions to the surface. The illustrations complement the text beautifully. Yeo uses art to underscore the difference between the natural world and the world of the vampyres - a place of darkness, where light is shunned. The sombre colours and use of light/non-light contribute to an atmosphere of desolation, and increase our understanding of the boy's desperation. The choice of silver for the font throughout was inspired - it adds to the feeling that Vampyre is not just a picture book, but a special manuscript. It's wonderful to see publishers producing picture books for older readers. Walker Books has provided excellent, comprehensive classroom notes for both primary and secondary schools. I'm tipping teachers and librarians will grab Vampyre and use it as a prompt for all sorts of wonderful creative and critical activities.